Looking for a special holiday treat for your favorite dog? 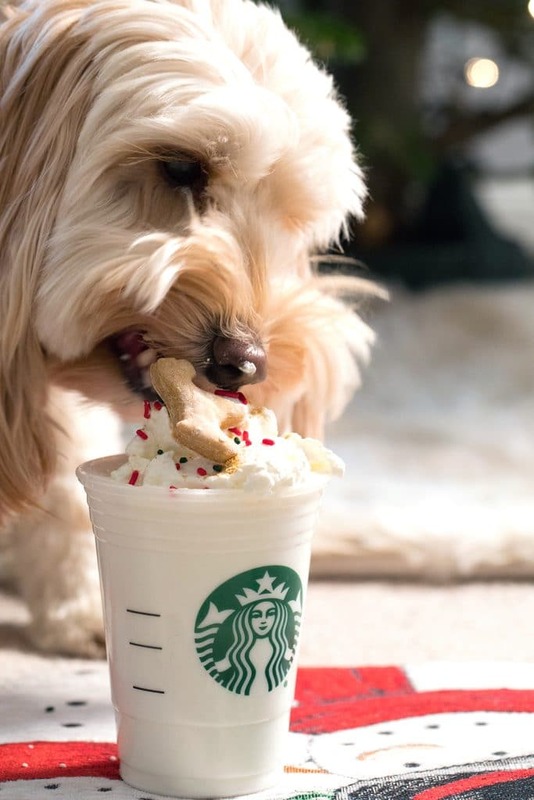 These Gingerbread Puppuccinos with Gingerbread Cookies for Dogs will give your dog something fun to sip on while you’re enjoying all those holiday cocktails! I didn’t think it was possible, but as my dog gets older, I’m pretty sure she’s getting more anxiety. She’s always been crazy anxious and scared of the world, but the last couple weeks have been on another level. We’re talking, she won’t go near our front door because we got a new rug delivered that’s standing upright in the corner. She looks up in terror at every basketball hoop and mailbox on our daily walks, despite the fact that she’s walked by them a million times in the past with no problem at all. She doesn’t cry or bark at other dogs anymore, but now army crawls away from them as quickly as possible. Don’t even get me started on her reaction to the house that put up a blinking holiday light display. She was not impressed. It hurts my heart to see her so scared over what seem like such silly things. I work with her every day on getting over her fears, but I think anxiety is just a part of her makeup and training can only go so far (we once got her a highly-rated anti-anxiety device for her collar and the second I took it out of the package, she RAN and wouldn’t let me get near her with it). I think that’s partly why I like spoiling her when I can and keeping her spirits bright as much as possible. Especially during the holiday season. From pupcakes to pancakes and more, I love making homemade dog treats for Winnie and this Puppuccino is one of the easiest yet. I feel like we all want to give our dogs a little extra love during the holidays when we’re all indulging so much (especially if said dog gets extra anxiety over the UPS man ringing the doorbell 4 times a day!) and this is one of the most perfect ways. 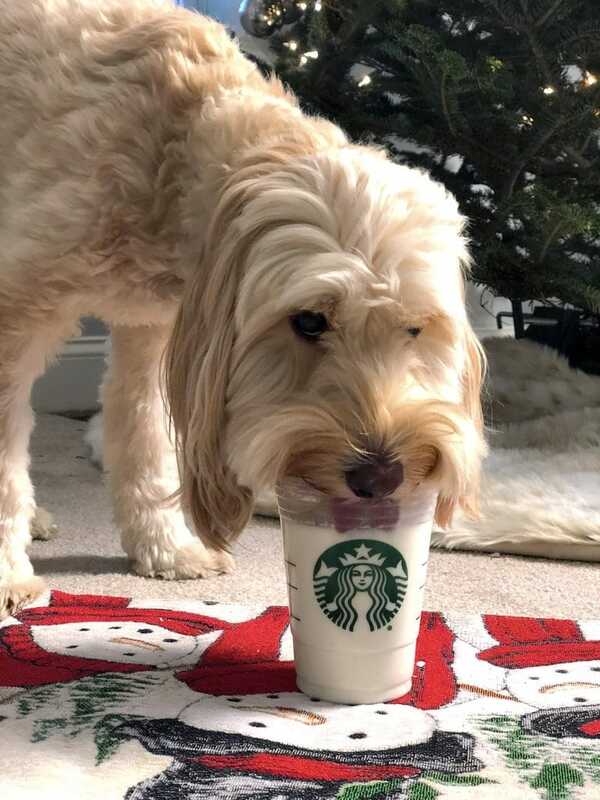 In case you haven’t heard of Puppuccinos, they’re “drinks” you can get for your dog at Starbucks. OK, so it’s really just whipped cream that the barista will put in a cup for you if you ask. 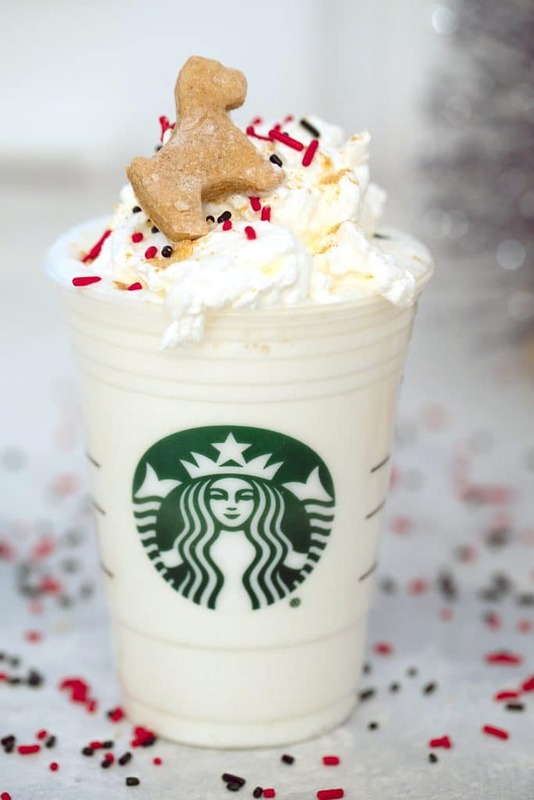 This Gingerbread Puppuccino is more than just whipped cream, but still incredibly simple to whip up. Of course, I also made homemade gingerbread cookies for dogs, to serve along with the Puppuccino… Gingerbread Pups, if you will. I used these awesome little Meri Meri cookie cutters that my mom got me for my birthday. 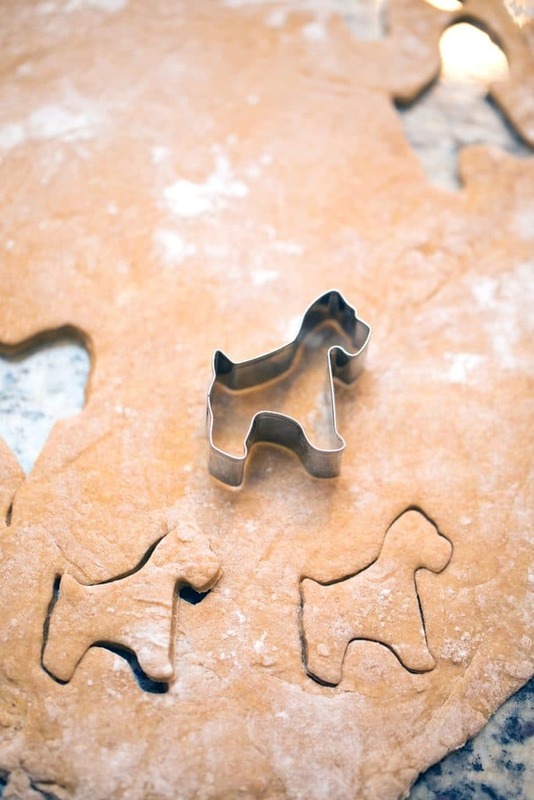 There’s no mini labradoodle (Winnie’s breed) cookie cutter, per say, but I found the one I felt like most suited her. I’m pretty sure it’s some sort of schnauzer and it doesn’t quite have Winnie’s tail, but I think it’s close enough. Winnie didn’t seem bothered! These gingerbread cookies are a very simple cookie made with whole wheat flour, all-purpose flour, and ground ginger. No molasses or anything here, so I suppose these aren’t true gingerbread, but proper dog-friendly gingerbread instead. That said, did you know that many vets say ginger is great for dogs? It can help with nausea, bloat, heartworm, arthritis, and more and is even said to help fight cancer. So, I’m feeling pretty good about giving my dog ginger cookies and a special ginger drink. 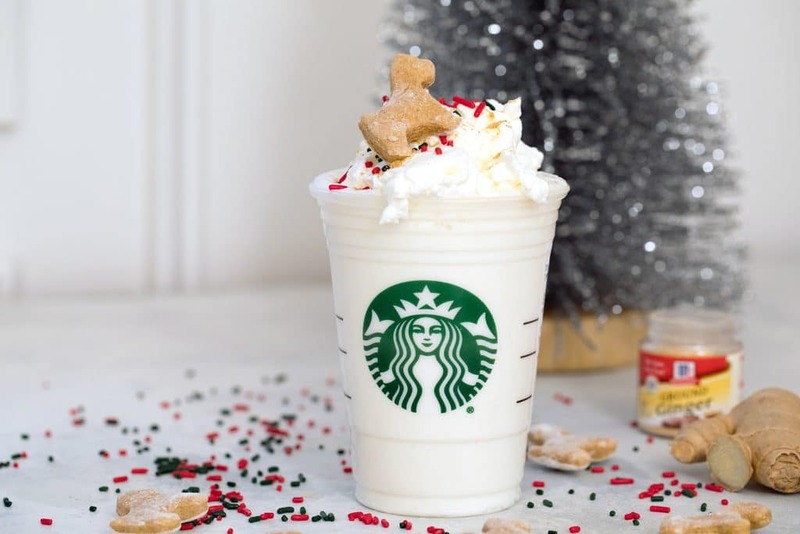 The Gingerbread Puppuccino is simply coconut milk (the kind in the carton), 2% Greek yogurt, and fresh ginger blended together. Of course, it’s topped with homemade whipped cream, a little ground ginger, and a couple holiday sprinkles for good cheer. You can whip this up with 5 minutes and top it with a dog-friendly gingerbread cookie or a store-bought biscuit if you choose. 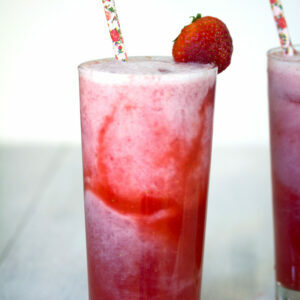 Take a sip…. It’s quite delicious and totally appropriate for human consumption, as well! So, now the big question I know you’re all wondering… Did Winnie like it?? Yes, she loved it! She was so happy to dig in. She went right for the whipped cream and then started licking up the Puppuccino. Hooray! As I’ve mentioned before, Winnie is a very picky eater, so I get really happy when I make her a homemade treat that she’s excited about. 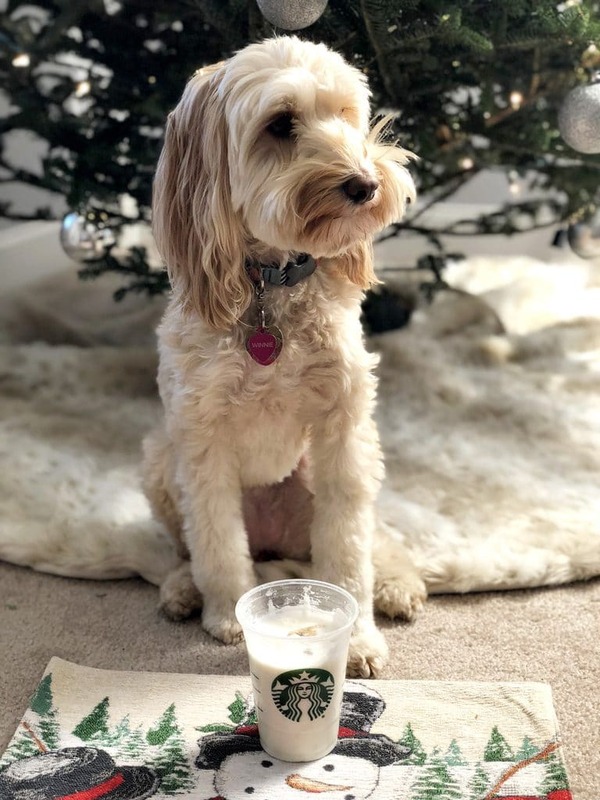 And she not only enjoyed the Puppuccino, but she’s been snacking on the gingerbread cookies for the last week. 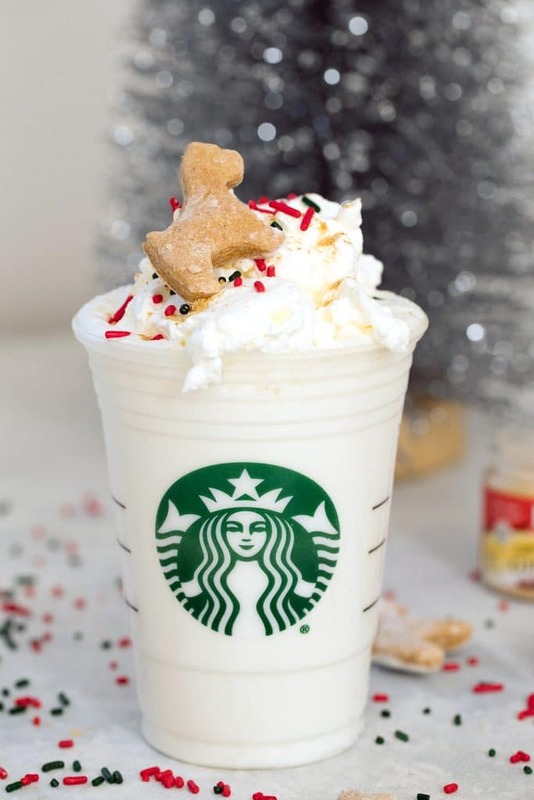 I should note that the Puppuccino in the photos is actually a double Puppuccino, so if you want enough to fill a grande Starbucks cup, you’ll need to double the recipe. I don’t recommend you let your dog drink a double in one sitting! Winnie drank about a quarter of this before stopping. I’ve cooked and baked for Winnie plenty, but this is the first drink I’ve made her… And I’m sure it won’t be the last! 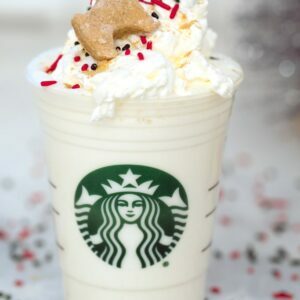 In fact, I think I’m going to make her another Gingerbread Puppuccino on Christmas when everyone else is celebrating with eggnog and holiday cocktails. Do you like to treat your dog a little extra during the holiday season? 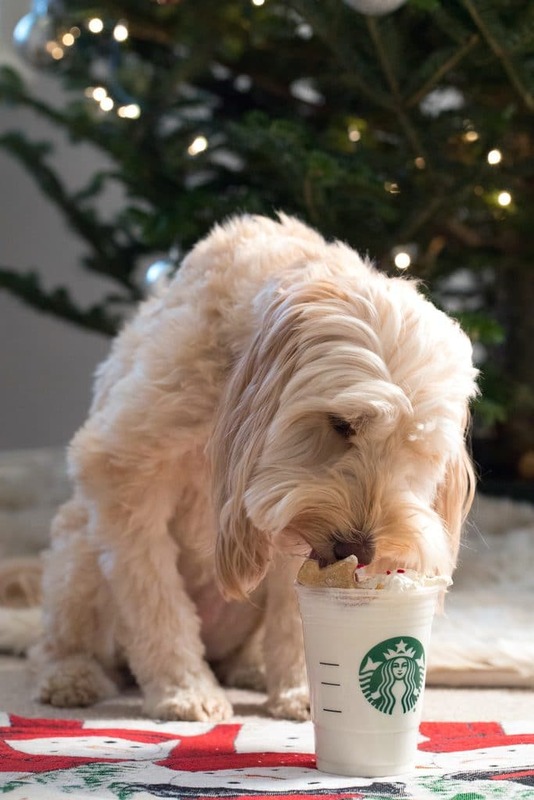 Have you ever ordered him or her a Puppuccino at Starbucks? *Remember that every dog reacts differently to foods (and some can’t do dairy), so check with your vet if you have any questions! Looking for a special holiday treat for your favorite dog? 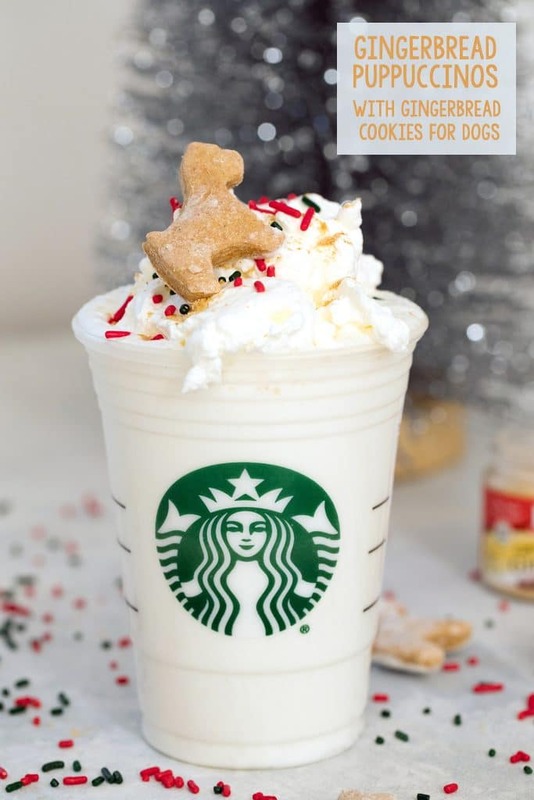 These Gingerbread Puppuccinos with Gingerbread Cookies for Dogs will give your dog something fun to sip on while you're enjoying all those holiday cocktails! Add coconut milk, Greek yogurt, and chopped ginger to a blender and blend well. In a bowl with a hand mixer or whisk, beat heavy cream just until stiff peaks form. Pour Puppuccino into a cup and top with whipped cream. Sprinkle ground ginger and sprinkles on top. Garnish with a homemade gingerbread cookie or other biscuit. Pre-heat oven to 350 degrees and cover a baking sheet with parchment paper. In a large bowl, whisk together whole wheat flour, all-purpose flour, and ginger. Mix eggs and 1/3 cup water into flour mixture until well combined. Add additional water in 1 Tbsp at a time until dough is soft and firm without being dry or crumbly. You might only need 1 Tbsp of the water. On a lightly floured surface, knead dough a couple times by hand until it all comes together. Roll dough out to about 1/4" thickness and cut shapes out with cookie cutters. Gather any leftover dough, knead together, roll out again, and cut out more cookies. Place cookies on prepared baking sheet about 1-inch apart. Bake for about 12 minutes, until cookies are just starting to turn golden at edges. 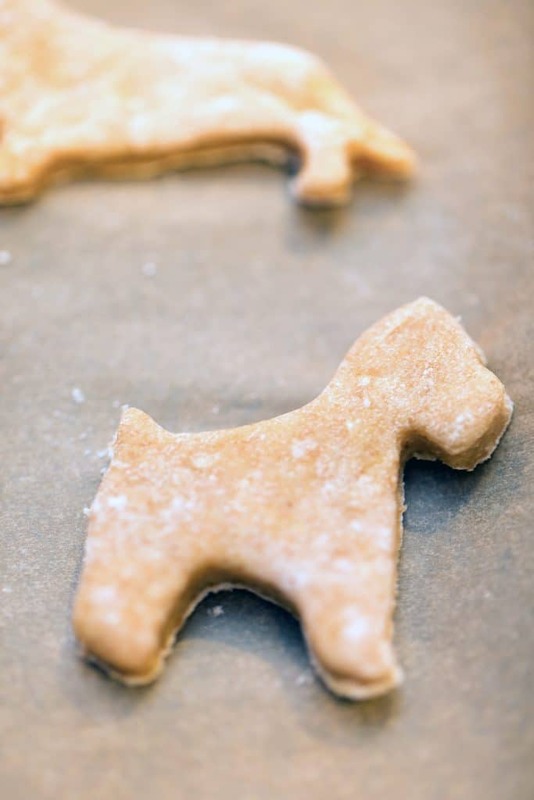 Bake 1-2 minutes longer for a crispier cookie (my dog prefers soft!). Let cool on baking sheet for a couple minutes before removing to wire rack to cool completely. The amount of cookies Gingerbread Cookie recipe makes depends on the size of your cookie cutter. 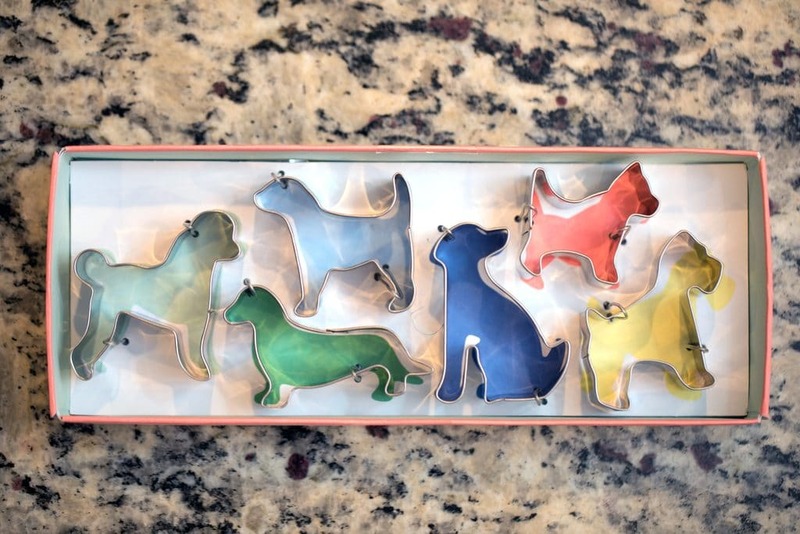 With my small dog cookie cutters, I got about 5 dozen cookies. 5 Responses to "Gingerbread Puppuccinos with Gingerbread Cookies for Dogs"
Have you tried using Rescue Remedy for Winnie? It works like a treat for my Jack Russell who is scared of thunder, loud bangs and noisy bowls. I cannot make them anything with dairy in it as dogs are lactose intolerant, and my Boxer gets the worst upset stomach if she eats any diary. I LOVE this, Sues! My dog absolutely adores puppachinos. Whenever we get in any kind of drive thru line, she starts looking for her puppachino. This is such a fun idea, especially with that cookie. And so cute, too! My little guy has anxiety too. He can’t stand when I leave him. I think he’s addicted to me (or maybe it’s the other way around, lol). Winnie is so adorable and it looks like she is spoiled rotten 🙂 Love this little treat! @Tandy- We’ve tried A LOT, but haven’t looked at Rescue Remedy yet; I’ll look into it! We actually tried prozac and a couple other meds, but nothing was helping at all so we took her off. Aw your poor pup! Most dogs can actually handle some dairy, but some can def be lactose-intolerant like humans. This Puppuccino is pretty low in lactose since coconut milk is lactose free and Greek yogurt is low. But definitely not worth it if your pup will feel sick! Winnie is absolutely adorable! I love that you made this for her.